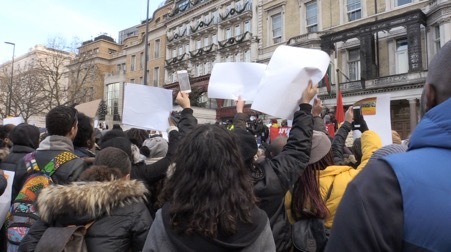 Hundreds of protesters descended on the Libyan embassy in London on Saturday to demand the end of slave auctions in Libya. Demonstrators gathered outside the embassy in Knightsbridge around midday, brandishing placards emblazoned with the words “do not sell slaves” and then marched to Parliament Square. Protesters joining the march think slavery is contrary to African humanity. They hope they can raise the public’s awareness of the crime, as well as call on the UK government to put pressure on Libyan leaders to stop the illegal markets. UK-based NGO African Lives Matter have organized protests across different cities in the UK. The petition calling on the government to ‘put pressure on Libya to stop enslavement of Black Africans’ has got over 262,000 signatures so far, and the UK Parliament is set to debate the petition on December 18. Many celebrities, including Cara Delevigne and Naomi Campbell, have publicly supported the demonstration. 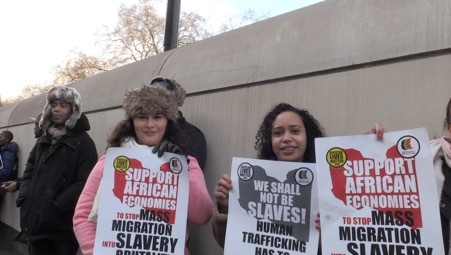 What lies behind today’s anti-slavery march? Since CNN released film of people being sold in a modern-day slave market In Libya, there has been an outrage response. The footage was the first evidence of the 21st century slave trade and people are amazed to see that it still happens now. In the video, young men believed to be migrants trying to reach Europe are seen being sold off as farm workers. Libya is known as ‘the gateway to Europe’, and most of the people trying to get into Europe depart from Libya as they attempt to cross the Central Mediterranean which is currently the main entry point into the European Union. Because of the wars, environmental issues and a lack of work, millions of undocumented people attempt to enter the European Union from countries to the East and South. People who want to do the crossing often get the help from smugglers who take their money and pile them into boats which are often unsafe. Many of the people are taken into a slave market then, and some of them drown or even go missing as they make the journey. In Libya’s slave market, slaves are even priced. Two slaves worth about 800 dollars are shown in the CNN footage. European countries cannot accommodate everyone trying to enter the European Union in search of work and safety, thus there is no organised migration system. It is this which has allowed people smugglers to thrive and flourish. The Libyan Government responded to the public outcry over the CNN footage that their country is going through difficult times, and addressing this phenomenon exceeds the national capacities. The anti-slave market and the Libyan government’s response both generate people’s outrage. Protesters do not want any of their precious, priceless brothers, sisters and children sold in Libya. The UK-based NGO African Lives Matter have organized protests in many cities in the UK, and the IOM (International organization for Migration) have influenced the closing of 6 out of the original 30 detention centres so far. With each protest being held, demonstrators are aiming to achieve more in the future. 1. Demanding the closing of the remaining 24 reported inhuman detention centers. 2. Putting pressure and responsibility on African presidents, including AU, ECOWAS to organize rescue mission to withdraw our brothers/sisters who are detained and bring them home. 3. United African leaders voices along with the UN need to condemn the slave trade and murders of any of their citizens, and request that Libya makes it a law to prosecute anyone caught or found guilty of the selling of humans or murders of innocent immigrants. Prince Mahihgue, the CEO as well as founder of the Afro United LTD told WestminsterWorld that what they are doing now is to raise the public’s awareness, and it is the ultimate solution to stop the slave trade not only in Libya but also all around the world.